At Coro we believe chocolate should be a fun and sharing experience. We don’t claim to be master chocolatiers, in fact its quite the opposite. Our aim is to give customers their chocolate fix but not just from your standard bar of chocolate. 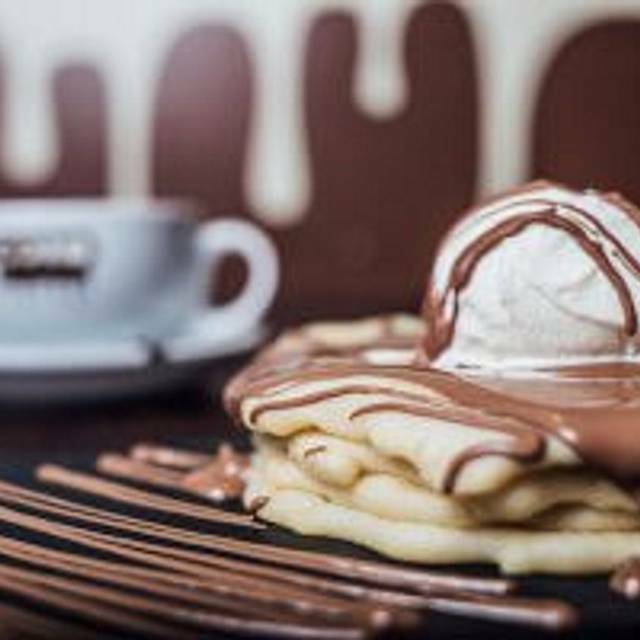 We pour our chocolate over freshly made pancakes, into our buttery crepes and drizzled onto our fluffy waffles. If thats not enough we’ll give you a fondue to dunk some fresh fruit, cake or sweets into melted chocolate with a hot chocolate like no other to wash it all down. A freshly made sweet crepe with ground cinnamon coated apples. A freshly made sweet crepe with fresh strawberries, raspberries and blueberries topped with cream and raspberry coulis. A freshly made sweet crepe with lemon curd, crushed meringue and sugar. 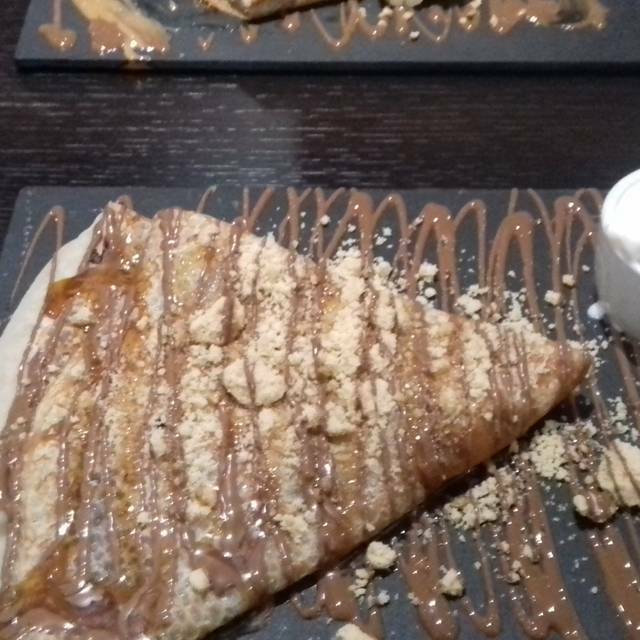 A freshly made sweet crepe with melted milk chocolate, caramel sauce and crushed shortbread. A freshly made sweet crepe with peanut butter, melted chocolate, fresh banana and crushed peanuts. A freshly made sweet crepe with a salted caramel sauce, broken pretzels and vanilla ice cream. A stack of 4 freshly made pancakes served with butter. A stack of 4 freshly made pancakes served with lemon juice and sugar. A stack of 4 freshly made pancakes served with, strawberries, raspberries, banana and blueberries. Drizzled with maple syrup. 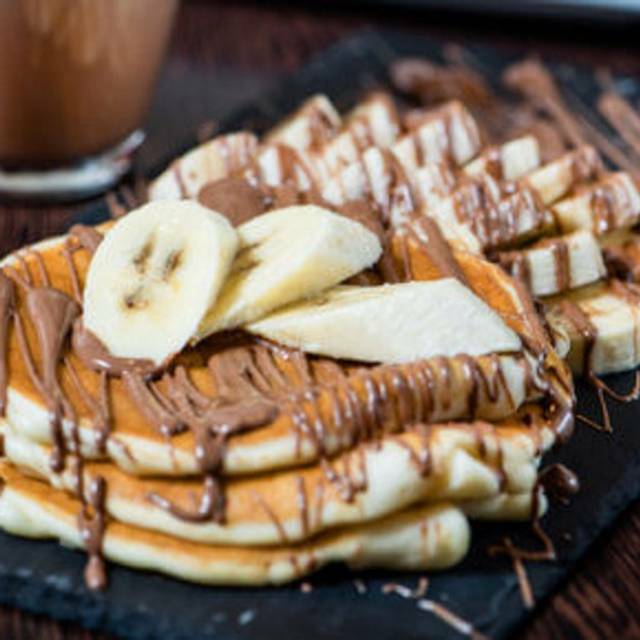 A stack of 4 freshly made pancakes served with melted milk chocolate and fresh banana. A stack of 4 freshly made pancakes served with melted milk chocolate and fresh strawberries. Crushed Shortbread, Strawberries, and Berry Coulis, topped with melted white chocolate and strawberry ice cream. A stack of 4 freshly made pancakes served with melted milk chocolate and a scoop of vanilla ice cream. Two or four waffles with fresh banana and melted chocolate topped with whipped cream, nuts, and chocolate shavings. Four Waffles with a split banana, a scoop of vanilla, chocolate, and strawberry ice cream, melted milk chocolate and topped with whipped cream, nuts, chocolate shavings, glazed cherries, and wafers. Two or four waffles with fresh strawberries, raspberries, blueberries topped with fresh whipping cream, white chocolate and raspberry coulis. 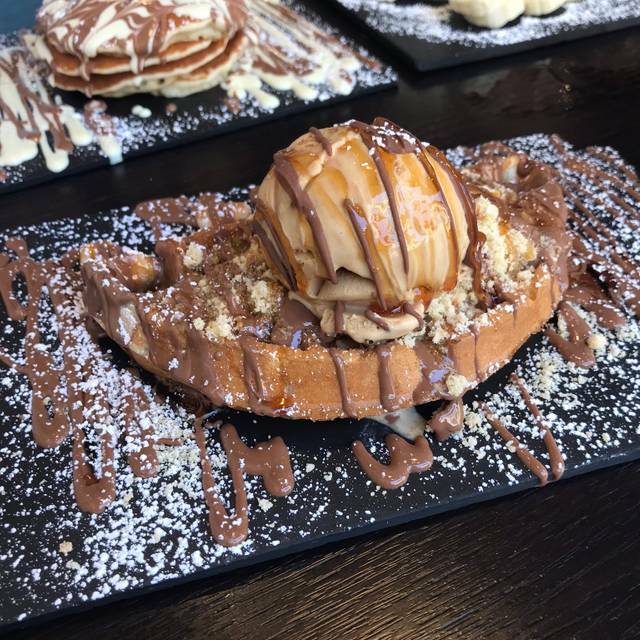 Two or four waffles with melted milk chocolate, topped with crushed shortbread, salted caramel ice cream & caramel sauce. Two or four waffles with melted milk and dark chocolate, Jaffa cakes and Jaffa cake ice cream. Four waffles with a different topping on each slice. 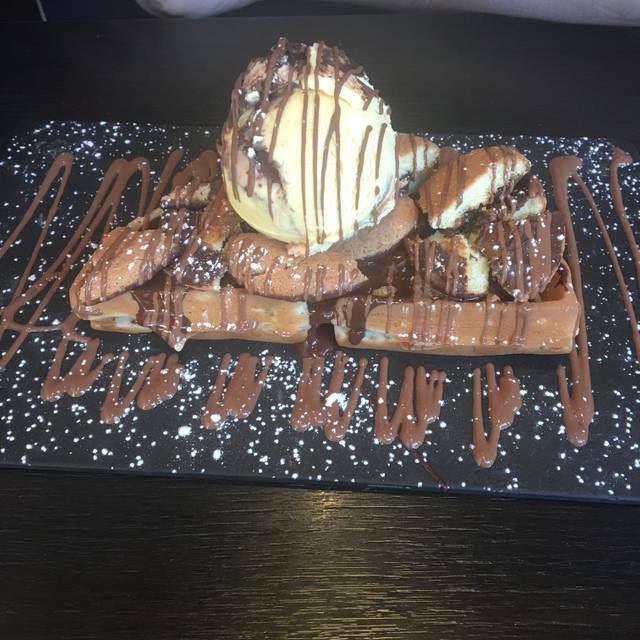 Melted milk chocolate covers the waffle and then has a slice with fresh fruit, marshmallow madness, ice cream and salted caramel and pretzels. Two or four waffles with melted milk chocolate, fresh whipping cream, cookies & Oreo's. Four Waffles covered in dark chocolate, a bed of bananas on the bottom, then topped with fresh whipping cream and strawberries, raspberries & blueberries. Last but not least, covered in maple syrup and a little more dark chocolate. Two or four waffles with melted dark and white chocolate topped with crushed Oreo biscuit and a scoop of Oreo Ice cream. Four waffles, with a different topping on each waf e. Melted white chocolate covers the base, and topped with a scoop of vanilla ice cream coated in toffee sauce, oreos covered in dark chocolate, crushed cookies on a bed of fresh whipping cream, and jaffa cakes coated with milk chocolate. A selection of brownie, flapjack, caramel digestive slice, lemon drizzle, fresh strawberries, and marshmallows served with a fondue of melted chocolate. A selection of fresh strawberries, banana, raspberries and orange with a dipping cup of melted chocolate. A selection of fresh bananas, strawberries, clementine, raspberries and marshmallows served with a fondue of melted chocolate. A selection of nougat, marshmallows, gummy bears, pretzels, jellybeans, and gummy strawberries served with a fondue of melted chocolate. A selection of large and small marshmallows and a choice of one dipping cup of melted chocolate. A moist triple layer gluten free chocolate cake filled and finished with a rich chocolate fudge icing and decorated with a chocolate shavings and dusted cocoa. Crunchy biscuit base topped with a soft creamy cheesecake, sticky toffee pieces and a layer of toffee sauce. Crunchy biscuit base topped with a soft creamy cheesecake, rich caramel and chocolate ganache. A real indulgent treat. Triple layered chocolate cake filled with peanut butter cheesecake filling. This cake is coated with a rich chocolate ganache and topped with crunchy peanuts and caramel drizzle. A hot chocolate dessert. This light chocolate sponge cake is covered in melted chocolate for a light and fluffy feel. Perfect for you chocolate lovers. Served with a choice of ice cream, vanilla custard or whipping cream. A moist doughnut inspired sponge pudding with a vibrant lemon and raspberry filling. Finished with a layer of fondant icing and served with vanilla custard. A light sponge cake with a custard centre and chunks of rhubarb. Served warm with a choice of ice cream, vanilla custard or whipping cream. Moist date and walnut enriched sponge. This pudding is finished by hand with a layer of indulgent toffee sauce. Served with vanilla ice cream. A dense sponge cake with a caramel centre and chunks of apple. This is served warm with a choice of ice cream, vanilla custard or whipping cream. Two scoops of milk chocolate ice cream, fresh banana pieces with melted milk chocolate and chocolate brownie topped with whipped cream, peanuts and a little more melted chocolate. A scoop of Jaffa cake ice cream and white chocolate ice cream, pieces of Jaffa cake, segments of fresh oranges, poured in melted milk chocolate and topped with whipped cream. Two scoops of milk chocolate ice cream, a scoop of white chocolate ice cream, with melted milk chocolate and chocolate brownie topped with whipped cream and drizzled melted chocolate. A Scoop of raspberry ripple and white chocolate ice cream, crushed meringue, fresh strawberries and raspberries. Poured in melted white chocolate and topped with raspberry coulis. A scoop of strawberry, chocolate and vanilla ice cream. Topped with gummy bears, jelly beans, marshmallows, whipped cream, melted chocolate, and 100's and 1000's. A scoop of milk chocolate and strawberry ice cream, topped with fresh strawberries, melted milk chocolate, and chocolate brownie, with whipped cream and chocolate shavings. Make your own Waffle, Crepe or Pancake! Strawberries, Blueberries, Banana, Raspberries, Apples, Shortbread, Meringue, Pretzels, Marshmallows, Crushed Nuts, Chocolate Shavings (Milk, Dark or White), Oreo Biscuit, Wafer, Sugar. Milk Chocolate, Dark Chocolate, White Chocolate, Caramel Sauce, Raspberry Coulis, Lemon Curd, Maple Syrup, Peanut Butter, Salted Caramel Sauce, Toffee Sauce, Lemon Juice. Fresh whipping Cream. Ice Cream Flavours: Milk Chocolate, Dark Chocolate, White Chocolate, Vanilla, Jaffa Cake, Strawberry, Ferrero Rocher, Mint Choc Chip, Oreo, Raspberry Ripple, Salted Caramel. Amazing place with very friendly staff. Food was great and I would highly recommend their milk hot chocolate! The food was amazing and the amount of choices on offer was great. The staff were very friendly, however, my only criticism is that there was only one member of staff serving all the tables so we had to wait a while to be given the bill and then to actually pay. Very overpriced and deceptively worded menu. Cheesecake isn't cheesecake. It's cake with icing. 2 waffles is actually a half waffle. Go somewhere else. Mediocre and expensive. Great food. Restaurant could have been a little tidier. Toilets could have been nicer. Food could have been a little better value for money. I have been here a few times and once with my son who was 3, and they where amazing. Will be going back soon! Popped in here tonight for the first time and we both really enjoyed it and thought it was reasonable. 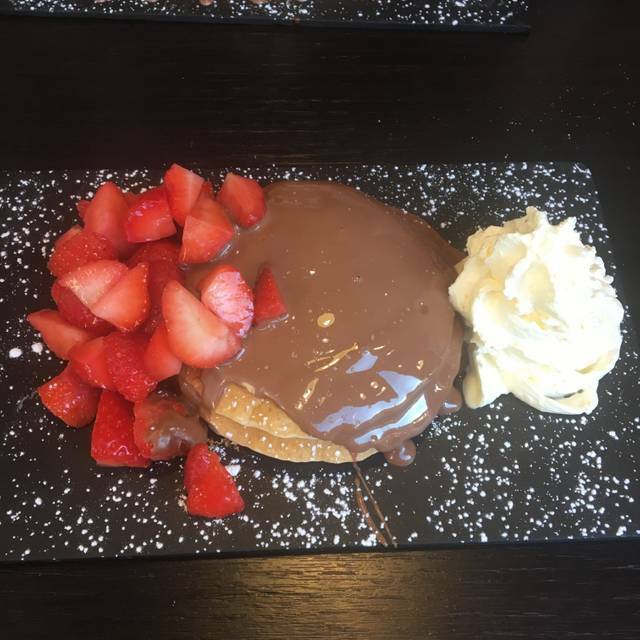 I had a strawberry milkshake which was lovely and didn’t taste artificial and my husband said the same about the banana one and then he had the chocolate orange waffle which he said were really good and I had melted chocolate and strawberry pancakes which were delicious and just enough in the portion. we will back Coro. A few people I know had been here and I follow Coro on Instagram and really wanted to try it as the photos looked amazing, I was not disappointed. The service was quick, good value for money and the food looked and tasted amazing. The place was a bit quiet but it was a midweek lunchtime so probably a quieter time to go. Would definitely go back again soon. Staff very friendly, nice atmosphere. Good menu not a huge savoury choice but we knew that before we went. We had a sweet tooth and wanted some hot chocolate on this rainy day and were greeted by a very friendly staff and had some great drinks and sweets! when I reached the shop in Glasgow to that I had booked for my boyfriends birthday which was booked online I was then informed by a sign that the shop was closed until 26th of this month , shocked and annoyed as this is was a surprise on a day out I frantically had to find somewhere else to be out , I was very disappointed and upset which had annoyed me for the rest of the day book shouldn’t have been left online and avilable when shop is shut. The staff were very accommodating and also took my special request and acted on it! Great experience from start to finish. Food was ok but expensive for what you get. Service was diabolical! Food and drinks (a coffee and what they call 'winter warmer') were served cold, taste was good but drinking and eating that food cold when outside was around 1°, was not enjoyable at all. The room was also freezing, to the point we had to stay all the time with winter coats on besides being indoors. Service was really slow and, by the time we got the food, we had finished already the drinks. was recommended here by an acquaintance and it lived up to the expectation. We ordered the double chocolate pancakes and the crepe pizza and both were outstanding!! Well worth a visit...food was fabulous and the staff couldn't be nicer. Many thanks to staff members craig and Liam for making our visit all the more enjoyable. loved my visit here, will definitely be back! the service was amazing and the decor is gorgeous. the food was delicious, we got it on a deal however i think the prices without a deal are a little pricey. Straight away the young man at the front of the cafe was lovely, hence the three pound tip. He was very helpful and told us about the size of a product (in case it was two big for myself or my partner to eat, which saved us money). My cookie waffles were warm and covered in cookies, cream and two different chocolates and it was fantastic. My partner had the chocolate peanut butter cake with ice cream and we were slightly disappointed that his cake was chilled, but a minor issue. It was fantastic overall and I’d definitely go again. Amazing Crepes and Pancakes - Chocolate heaven!!!! Went on a girls afternoon without the kids lol and we all loved the food. We ordered the fondue for 2, chocolate covered pancakes and millionaire crepe. Everything was delicious and staff were very friendly with excellent service. We will definitely be returning soon with the kids as it was such a relaxing child friendly atmosphere. Very disappointed. The waiter forgot to put our order in so we waited over an hour for a waffle. There was only a handful of people in place so I don't quite understand what they thought we were doing sitting there for an hour. The waiter that took our order never even apologised. The waitress we asked about our food was nice and said we didnt need to pay, which was nice of her. When we finally got our food it tasted stale and the waffle was very thin. I actually bought a deal on a website so it was reduced but definitely not worth the full price. It was just half a thin waffle with a few stale oreo cookies chucked on top. Amazing! hard deciding what you want so much choice! Will be back!!!! Went here on Sunday and was greeted with a very friendly girl. Menu looks quite exciting but is expensive. Figured would be worth it. I ordered the Strawberries with milk choc fondue. This was priced at 8.99 and described as a large bowl of strawberries. To say it was disappointing is an understatement. There was maybe 4-5 strawberries and a small pot of melted choc. The strawberries were cut up so thin that the fondue fork could barely pick them up. They were also very wet so didn't taste entirely fresh. Dish was Vastly overpriced. Choc was lovely. The rest of my table got pancakes and waffles which were much more worth the price. Avoid the fondue it's just not worth the money.